Floating in the azure waves and only a stones throw away from the north coast of Formentera, this pequeña aisla (little island) is often forgotten about by many beach goers, creating a haven of peace and tranquility. Before going to the island of Espalmador, please note there are no shops or water sources on the island, so all food and water must be taken with you, and all rubbish brought back. As they say, take only photographs, and leave only footprints! The island can be reached by small ferry from Puerto La Savina, or the jetty at the northern end of Illetes beach. Take note of ferry times so you do not miss the last ferry back to Formentera! 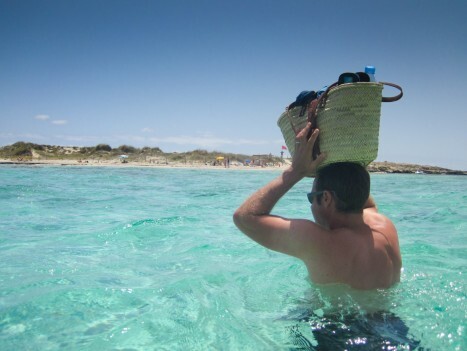 Alternatively, for the more adventurous, you can swim or walk across the shallow stretch of water between Formentera and Espalmador. Check sea conditions are calm before attempting the crossing, and leave plenty of time to get back. The only way around Espalmador is by using your feet. It will take about an hour to circumnavigate the island, not taking into consideration the time you will spend chilling out on the fantastic beaches. Or smothering yourself in the famous espalmador mud from the centre of the island. Although this area is now roped off and rumour has it that it was once used by a farmers pigs, so smear on your body at your own discretion! Theres not a lot to do on espalmador except the obligatory swimming and chilling, but leave time for a little exploration too. The Torre de sa Guardiola is located at the north western part of the island and has an interesting history. The tower was built in the 1800’s and according to historical records, was manned by 2 guards and had a cannon atop the tower for defense and to deter would be pirates. It was decomissioned in 1875, is still a prominent landmark and worth a visit for its 360 degree views from the top if you’re passing by. There are various small beaches located around espalmador, but the two main beaches that are worth a mention are playa s’Alga and playa Sa Torreta. Playa s’Alga is the main beach, forming a graceful sandy arc around the bay, and of course filled with the stunning turquoise sea that Formentera is known for. Many boats moor here in summer, but even at its peak, you can be guaranteed there will be be plenty of room to lay your sarong. (See main picture) Playa Sa Torreta is located at the northern end of the island and unusually the sand is a lovely golden colour. The water here can get quite warm due the the shallow bay and the sea is usually very calm as the bay is sheltered by the islet of sa Torreta that lies only a short distance off shore.